Happy Thursday! I know some are preparing for a weekend full of rain while we are preparing for a little bit of a Fall cool-off here in Texas. 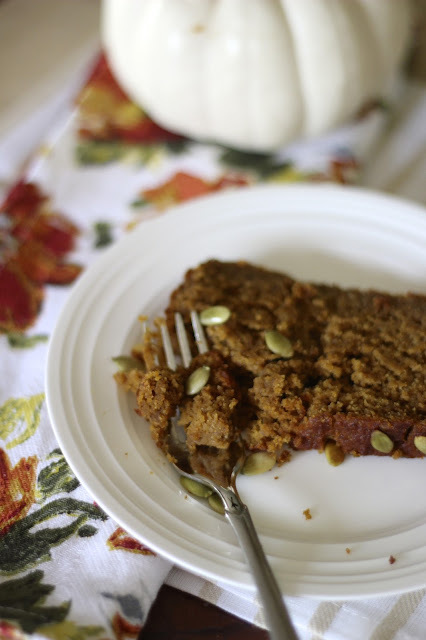 In the spirit of crisp temperatures, I wanted to share a recipe I have been perfecting over the last two months, Gluten Free and Dairy Free Pumpkin Bread! My family isn't Gluten or Diary Free but we do try to watch how much we consume, and anytime I can make a classic recipe like this healthier, I'm excited! I hope you enjoy this as much as my family and friends have! 1. Preheat oven to 350 degrees Fahrenheit. Grease a 9-inch by 5-inch loaf pan with coconut oil or an oil mister and set aside. 2. In a large bowl, whisk together the brown rice flour, almond flour, brown sugar, baking soda, baking powder, pumpkin pie spice, cinnamon, cloves, and salt. In a medium bowl, whisk together the coconut oil, Molasses, pumpkin, applesauce, vanilla and eggs. 3. Pour the wet ingredients into the dry ingredients and mix with a spatula until well-incorporated. Note, the batter will be very thick. Spread the batter evenly in the pan. Sprinkle the pepitas over the top if using. DAIRY OPTION: Sub melted butter on top for the coconut oil. FOR BREASTFEEDING LADIES: Add 3 tbl. brewers yeast and increase brown sugar to 3/4 cup instead of 1/2 cup. This will help build up a good milk supply and increase fat content of milk. Linking up with these great ladies today: Fabulous Foodie Fridays, Foodie Friday and Everything Else, Foodie Friends Friday, FoodieFriDIY, Freedom Fridays, Friday Favorites, I’m Lovin’ It, Weekend Potluck, Our Mini Linky Party, Link Party Palooza, Pretty Pintastic Party.